Problem 1: Mohit is driving a scooty with the speed of 10 km/hr for 2hr. How much distance will she travel? 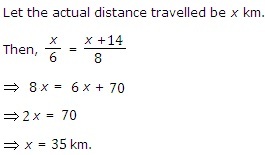 Distance traveled d = ? Problem 2: A cycle race is going on, a cyclist is moving with the speed of 10 km/hr. He has to cover a distance of 15 km. How much time will he need to reach his destiny? time taken t = ? Therefore, time taken by the Cyclist is 1.5 hr. Problem 3 : A train traveling at 72 km/h crosses a platform in 30 seconds and a man standing on the platform in 18 seconds. What is the length of the platform in meters? Solution: When the train crosses a man standing on a platform, the distance covered by the train is equal to the length of the train. However, when the same train crosses a platform, the distance covered by the train is equal to the length of the train plus the length of the platform. The extra time that the train takes when crossing the platform is on account of the extra distance that it has to cover = length of the platform. Therefore, length of the platform = 20 x 12 = 240 meters. Problem 4 : By walking at 3/4th of his usual speed, Shalini reaches office 20 minutes later than usual. What is her usual time? Solution: 3/4 of Shalini’s usual speed means, she takes 4/3 of her usual time to cover the same distance, i.e. she takes 4/3 – 1 = 1/3 time extra. Therefore, usual time of Shalini is = 20 x 3 = 60 minutes. 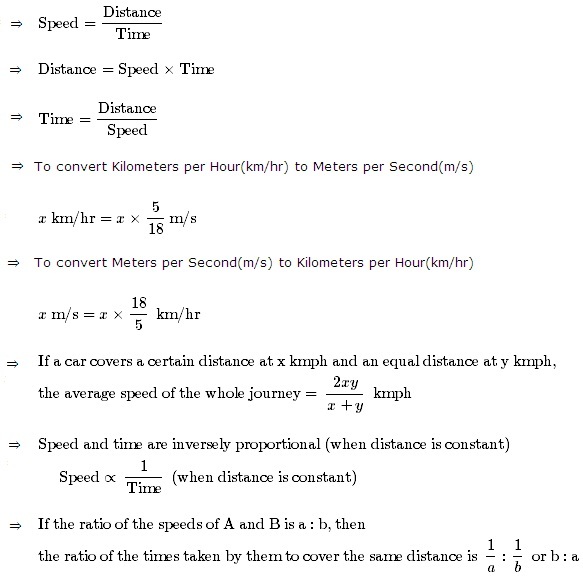 Problem 5 : If a person walks at 8 km/hr instead of 6 km/hr, he would have walked 14 km more. The actual distance traveled by him is. Therefore, The actual distance traveled by him is 35 km.